Some may argue that every occasion needs a dessert. I just don't have the sweet tooth for that. In my life, every occasion needs an appetizer or snack! However, sometimes I get in the mood and I feel like I need a dessert for the evening. Last week was one of those nights. The night before Thanksgiving, we have a long-standing tradition to get together with one of Paul's friends parents. We only see them a couple times a year and this night is booked for years to come to ensure that we can get together. It is truly a special night that we always look forward to! We usually go to their house, but this year we decided to switch it up since it would be easier with the kids. I knew we would be having our fill of pies and other desserts the next day, but I still thought this occasion was one of those that called for a dessert. I wanted to stay away from Thanksgiving menu, so I went straight to the Christmas season. 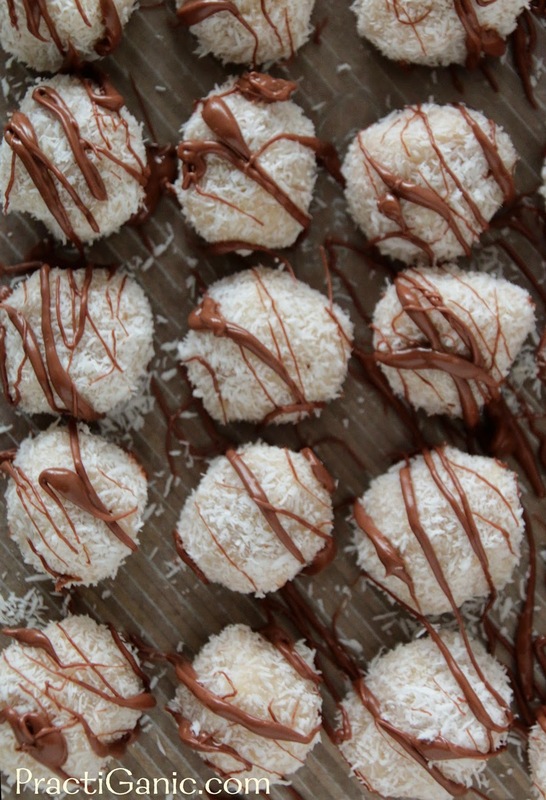 It was snowing that day, so it was quite fitting to make some snowballs. I loved them because even as I was taste testing and adding a few ingredients and amounts, they still only took 15 minutes to make. They are really rich so a little goes a long way! Again, that could be my lack of sweet tooth talking! In a food processor, puree almonds until they are almost dust. Add 2 c coconut, honey, coconut oil and almond extract. Mix until all the ingredients are well incorporated. 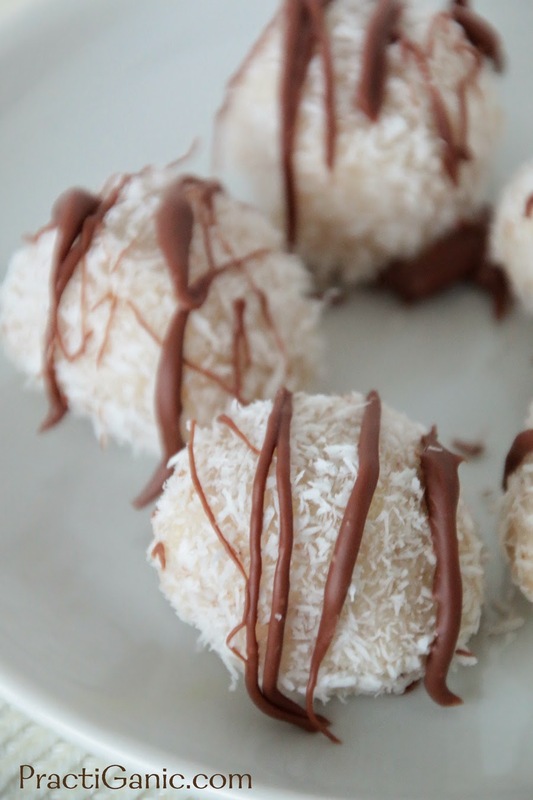 Form them into 1 inch balls then roll them in remaining 1/2 c coconut. If you'd like, melt chocolate in a double boiler and transfer to a pastry bag. 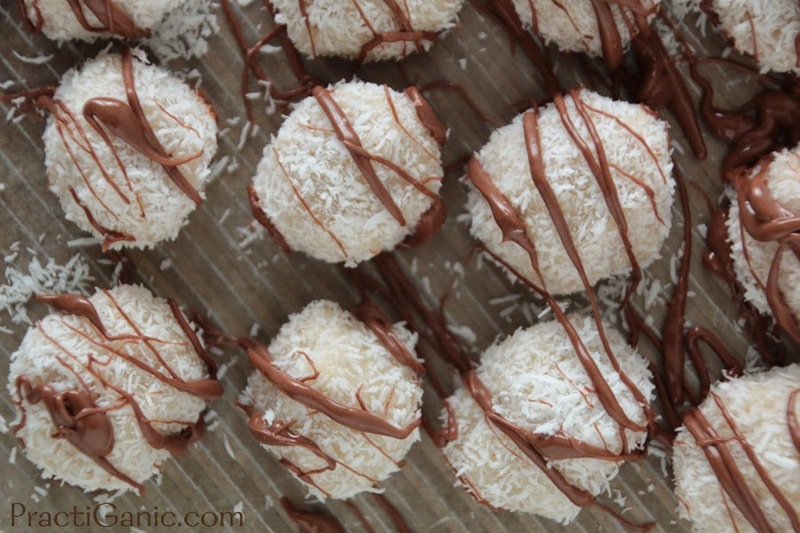 Decorate your snowballs. You don't have to keep them refrigerated but they hold up much better if you do ... besides, who wants a warm snowball?!? !